Stock car racing took a sharp turn for the faster in the ‘60s when Richard Petty and his pal Buddy Arrington began driving cars powered by a hemispherical combustion chamber engine, AKA "HEMI engines." In 1964, Richard and his Plymouth won the first of what would become a record-setting 7 Daytona 500s. Buddy’s son tinkered and toiled to squeeze ever more power out of these machines. It wasn’t long before anybody could buy a Hemi engine but the trick for the track was making our engines better and faster than theirs. Winning race drivers know that their under-the-hood power is part science and part art. It was here in the foothills of the Blue Ridge Mountains that the power to win became an art form. Today our staff is still made up of race seasoned Hemi engine experts, engineers and builders and they are still the best in the business. Our passion for winning has shaped the face of our business. 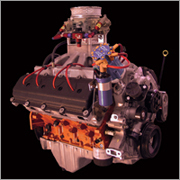 Arrington Engines is arguably the premier race engine technology company in the industry. The company operates from a 105,000 sq. ft. facility that houses the finest development, manufacturing and testing program in the business. AMI’s team of race-seasoned engine builders, tuners, machinists and dyno operators is second to none in racing. They literally worked hand-in-hand with Dodge engineers to develop the fearsome R5 P7, the engine that powered Dodge back into NASCAR racing and are still tweaking power from the new Dodge R6P8. It doesn’t hurt to be a stone’s throw from Martinsville Speedway, the original NASCAR Cup short track. Arrington is the winner of many Dodge Manufacturing Awards, as well as multiple winner of the Craftsman Truck Series Manufacturers Award and the Engine Builders Award. The most demanding NASCAR drivers have turned to them, including Penske, Petty, and Ganassi. And Russ Wicks, current holder of the world’s stock car speed record (244.9 mph) in a Dodge Charger powered by an Arrington engine, relies on us for the muscle he needs. What most people don’t know is that you can actually buy an Arrington-modified Hemi to drop into your own car. Or that Arrington offers unique stuff that simply isn’t available anywhere else. Everything from a 90mm “drive by wire” throttle body ready for dropping into your muscle car, all the way to the whole car. Arrington street editions are classics converted into modern supercars. Like our SRT-8 Chrysler 300LX powered by a 426 Hemi with Arrington NASCAR Grade 4.080b x 4.080s block and rotating assembly putting out 585 HP. It is loaded with fancy-schmancy parts and specially tuned for both street drivability and money-winning power when you want it. For example, consider this problem: if you own a classic muscle car and you want to dump a modern Hemi engine under the hood, you’re going to end up with a fuel-injected ride that runs off the instructions delivered by a computer chip. That’s nice for the showroom buyer who just wants to drive a powerful nameplate. But smart enthusiasts know that they can “tune” a showroom engine and get a lot more power from it. And real Hemi fanatics would like to kill that computer, and tune the engine the old-school way – by feel and touch. They know that tuning is the art that makes science run faster, the way to coax more power from an engine. Solution? Enter the ChipKillr™ Hemi engine tuning kit, a complete solution for restoring “tune-ability” to Chrysler 5.7 or 6.1 Liter late model HEMI engines. This is accomplished by exchanging the stock timing cover with a precision replacement unit designed to house a distributor, eliminating the need for computerized ignition controls.